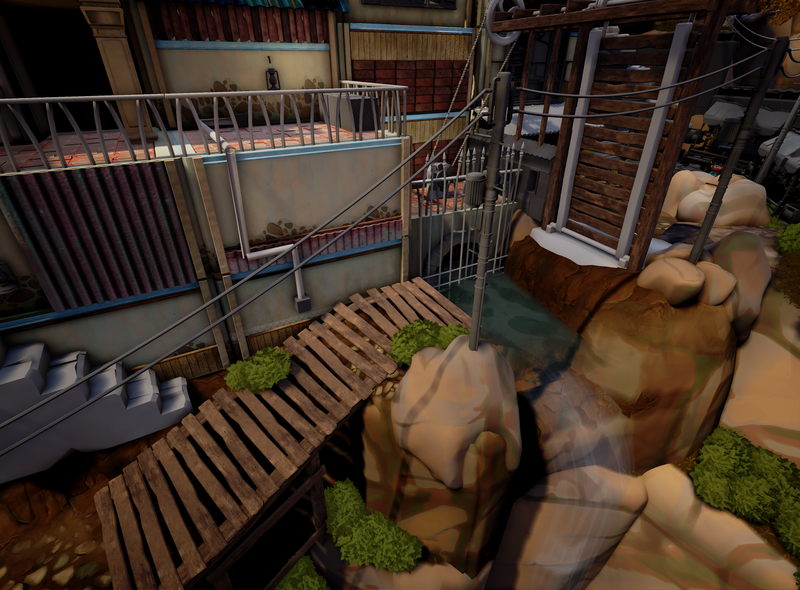 James Broderick Design Blog: FMP 15 - Climbing plants, bushes and fixing up level layout. FMP 15 - Climbing plants, bushes and fixing up level layout. Carrying on from last week I have been continuing work on some of the foliage, one piece that needed to be created was climbing plants which are a large part of breaking up the look of the level. I created the climbing plants using a high poly model of the stem, baking it down to a texture which I then path deformed along a spline. 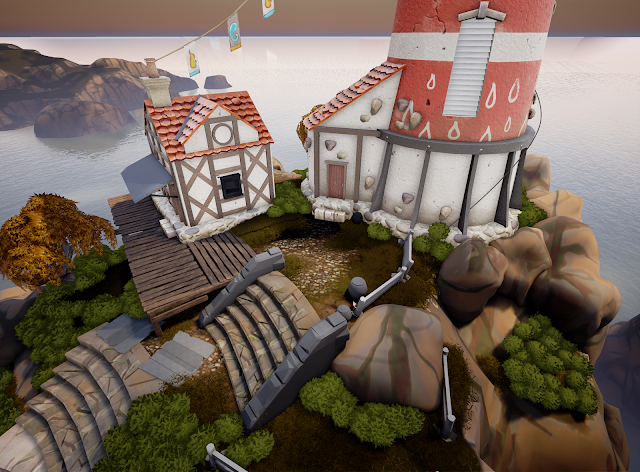 I have also created bushes in this time while Hazrat had the engine file to import some of his objects, when I got the engine file back I worked on trying to complete some of the larger blocked in assets in the level like the drawbridge and the wooden platforms outside the lighthouse. The lighthouse, almost complete with bushes and wooden platforms in place. Also the final lighthouse model has been imported. The drawbridge area, with boardwalk completed. More work has to be done on the starting areas, I made some rearrangements of some of the buildings but overall I am still waiting on some textures and reimports to be done so I could do those areas properly. The reason some of later areas are more finished is because the assets are largely the same object, being mostly foliage. Next week should be the last week on environment pieces before our cutoff period, after that we have to be in polishing the game. To achieve this goal I will be helping out with texturing larger environment objects and getting them completed so I can finish population of the level. Then I will move on to gameplay refinements needed for the hand-in, as currently new players find it hard to navigate the first puzzles.